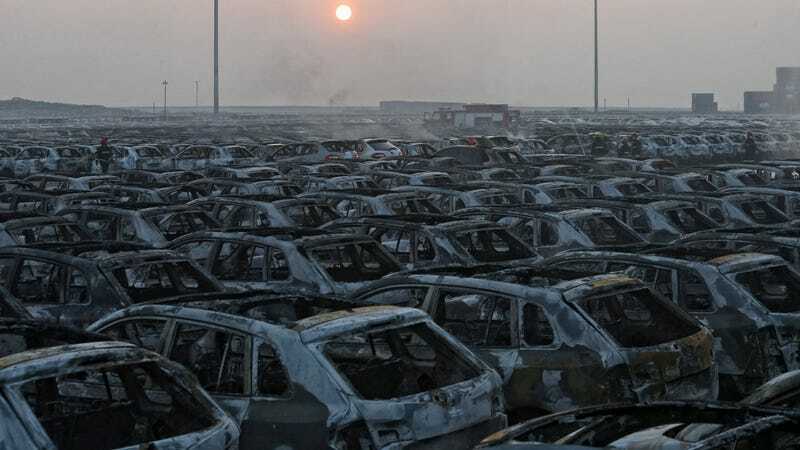 The chemical explosion in China left forty-four people dead and hundreds injured, not to mention the thousands of brand new Volkswagens that were waiting to be shipped from the port of Tianjin. 28 Magotans (locally built Passats) and 770 “Specials”, whatever those might be. The exploding warehouse hit the port with energy equivalent of three tonnes of TNT, so no wonder why the site was still smoking this morning despite the firefighters best efforts, who lost twelve of their own in this horrific disaster. Volkswagen’s insurance company and those waiting for the delivery of their brand new cars certainly won’t be happy, but these things happen all the time. Photo credit: Getty Images. Hat tip to Adam!